Shri Mataji: "About Sahasrara nowhere in the scriptures something was described"
"It became apparent that something was really very wrong. The Paramchaitanya had been activated to make everything work miraculously but not a single Sahaja Yogi was interested in knowing what it was doing! Prophet Muhammad made a single journey on a Buraq and Muslims made a mountain out of it. Prophet Ezekiel had a vision of"Yahweh on a throne and four winged creatures bearing the faces of a man, lion, an ox and an eagle," and Jews made a nation out of it. Sun Myung Moon had a single vision of Christ and Koreans made a Universal Church out of it. Here was a child of the Great Adi Shakti who made more that a thousand journeys into the Kingdom of God, and Sahaja Yogis made a joke out of it!" Shri Mataji Nirmala Devi “Today we are celebrating the opening of the Sahasrara. On this day I must say it was a great happening that took place on all the humanity. It was such an achievement, which I never realized before. Now I can see that without Self-Realization it would have been impossible to talk to people. Then this happened! I thought that how I will talk to people about it because no one would understand Me and it would be a big mistake on My part to say something about Sahasrara because even about Sahasrara nowhere in the scriptures something was described. It was absolutely an ambiguous description I would say where people could not even have thought there is a realm beyond Sahasrara, and one has to enter that realm where is the Reality. "All three of my main kundalini teachers refused categorically to discuss the seventh chakra. They felt that this chakra should be encountered without preconceptions of any kind to interfere with direct experience. It is therefore with a bit of hesitation that I write anything at all about this ultimate chakra... The Sanskrit name of this energy center is sahasrara, which means"to multiply by a thousand.”In a looser translation, sahasrara means tapping into the infinite spiritual dimensions that lie beyond the personal parameters of consciousness. Awakening the seventh chakra is most definitely an experience in which we transcend our individual minds and enter into perfect conscious harmony with the infinite spiritual wholeness of the universe. Let me simply say that the seventh chakra is the swirling energy vortex located right in the top of your head and swirling also above the top of your head, where you transcend individual consciousness and tap into infinite consciousness.”You"Are gone. There is no"you.”There is only infinite consciousness, of which you are an integral part. John Selby, Kundalini Awakening, Bantam Books, 1992, p. 190. With the explicit confirmation of Kash and Lalita's identities by Shri TriGunatmika Shri Nirmala Devi, all relevant information was reintroduced back into Shri Adi Shakti: The Kingdom of God. However, there was a lingering sense of uneasiness as their father struggled against rejection and ridicule from all sides. There was disbelieve, even outright rejection among North American Sahaja Yogis who knew about these spiritual journeys, and most turned a deaf ear. Some Sahaja Yogis felt that Kash was being self-advertised; that there were ulterior, selfish motives in writing this book; that his father was throwing his spiritual weight around by claiming he had Knowledge they should know. Others scorned and scoffed at the idea of consent being obtained from Shri Mataji in the Sahasrara. They regarded this attempt by a spiritual rookie to write a book, without any Divine Knowledge whatsoever, as atrocious. Those bristling with Vedic knowledge were furious that such claims being made. They had never come across any Hindu scripture describing such phenomena taking place. The fact that a kid was making such a claim immediately after having his Kundalini awakened only agitated their minds further. How could that be possible when they had spent decades reading sacred scriptures, praying, fasting, meditating, and doing penance just like their ancestors did for thousands of years? Kash siddhis (spiritual powers) were the work of spirit possession and nothing else. The father was told to shut up before he damaged Sahaja Yoga, and stop Kash before he damaged his head. The father thought otherwise. He looked at the deluded, divided masses of humanity and then peered far into the approaching millennium, and understood perfectly what Shri Mataji had meant when She said that," if you have to really bring them round through discussion and argument, you must first of all be well equipped with the Knowledge of Sahaja Yoga.”Hundreds of thousands had been given Self-Realization (Atmajnana) but hardly a fraction stayed back. There are so many thousands of religious and spiritual stalls in the international bazaar that it is difficult for these spiritual shoppers to make an educated choice as all profess to possess Truth and the path to spiritual release. It became apparent that something was really very wrong. The Paramchaitanya had been activated to make everything work miraculously but not a single Sahaja Yogi was interested in knowing what it was doing! Prophet Muhammad made a single journey on a Buraq and Muslims made a mountain out of it. Prophet Ezekiel had a vision of"Yahweh on a throne and four winged creatures bearing the faces of a man, lion, an ox and an eagle," and Jews made a nation out of it. Sun Myung Moon had a single vision of Christ and Koreans made a Universal Church out of it. Here was a child of the Great Adi Shakti who made more that a thousand journeys into the Kingdom of God, and Sahaja Yogis made a joke out of it! On October 6, 1995, a transcript of this book and the 'miracle' photograph was handed to Shri Mataji through Sahaja Yogi Manoj in New York, USA, at Her public program. A few days later on October 16, 1995, at 8:50 p.m. in Toronto, Canada, Kash father and SY James approached Shri Mataji Nirmala Devi after She had finished explaining to a Punjabi textile-shop owner about the greatness of Guru Nanak and the Self-Realization that He talked about. James wanted an answer to a question, which was: "Shri Mataji, am I your son?”She replied without hesitation," Of course you are! "Then SY Jay Chudasama, the Canadian representative, told Her about the intention of Kash's father to publish. Shri Mataji replied that She had not the time to read the transcript, but he should still go ahead. By again seeking Her consent, both Her physical Being on Earth and Her spirit Being in the Sahasrara were approached, and express permission obtained. But there was little faith among the Sahaja Yogis about Shri Mataji's granting of permission. 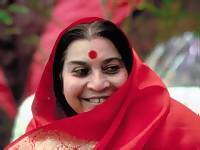 Hardly had Shri Mataji left Canada when he received a call from Toronto bluntly advising that there was nothing he could offer to the Sahaja Yogis as they knew 'everything,' and had been Her devotees for many years. In other words, they were senior yogis; so what did he know that they didn't? How could an amateur Sahaja Yogi who knew next to nothing about spiritualism write a book? What Knowledge could he offer that they did not possess? They had a perfect answer to their rejection reactions: Shri Mahamaya is playing tricks with both father and son. Sooner or later these spiritual pariahs will be exposed, and the matter laid to rest.